Now that our forum is past, future issues will deal with candidates. We’ll begin with the dark side. Of course I know the records of the incumbents, Councilwoman Susan Clancy and councilmen Ernie Bunch and Thomas McGuire. I have vetted Mary Elrod, David Smith and Ron Sova and find all of them to be suitable to the needs of Cave Creek. They are also independent thinkers without a slate bone in their bodies. I hope voters agree they will be able to sleep knowing they will protect Cave Creek citizens. Let’s start with forum no-show Jim O’Toole. I can see why he didn’t want to answer the questions I pose here. 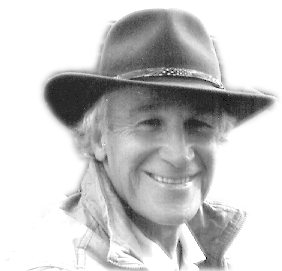 Why would a business man who violates the town code expect to be honored as councilman? O’Toole owns the building called the Roadhouse and has some sort of relationship with Hideaway owner Mark Bradshaw. They are both heavyweight motorcycle fans, or at least fans of the business and money generated by motorcycles. They have enough moxie, or something, that causes Cave Creek to bend over backwards for them. A couple of years ago the pair closed two lanes of Cave Creek road for nine days while they used their own parking lots for out of town businesses. The public had to endure long and slow interrupted traffic. This year when council depended on staff and one council member to regulate traffic, Town Manager Peter Jankowski, Town Marshal Adam Stein and Councilman Mark Lipsky (who has since resigned) closed two lanes for six days. We have been told by a business executive the Roadhouse realized an estimated $85,000 from vendors who camped on their parking lots. 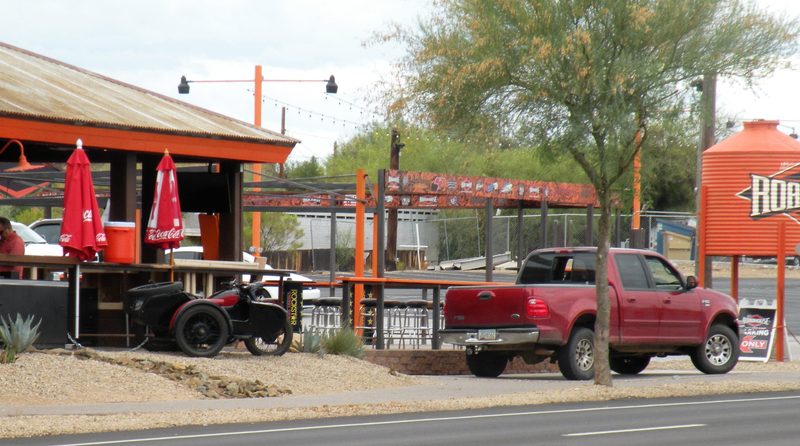 The next trick in O’Toole’s book was to create a “Patio.” Town property extends from Cave Creek Road to with a foot or so of the Roadhouse building. So extending the patio from the building was mostly on town property. O’Toole did not get a town permit to build the patio nor did he get approval to use town property. Thanks to Vice Mayor Steve LaMar for pushing to file charges against O’Toole. The Council voted 5 to 2 to have the patio removed, with Mayor Vincent Francia and Councilman Ernie Bunch voting to keep the illegal structure. Then O’Toole, we assume, or Bradshaw, hired Attorney Noel Hebets to speak to the council calling the illegal structure a trial period. Now they were serious and wanted approval to rebuild the patio. The vote was 6-1 against with the sole vote to allow it by Bunch. Now look at the cartoon space which is a picture taken on June 30. A three wheel motorcycle is parked on town property as is the pickup truck on an un-permitted fresh concrete slab on town property. The silo, as one council member called it, is still there thanks to a development agreement voted in by council that was misled as to the fact it is totally on town property. I agree to past decisions to require a signed complaint, especially when someone is breaking the law. So I will sign complaints on all of these issues. In the meanwhile remember to vote against Jim O’Toole. Since Bunch is not on the dark side he gets our vote if he pledges to stop voting for businesses who break our laws and appointing the likes of Eileen Wright to the planning commission. Other than that, Bunch is a smart manufacturer of printers with a lot of knowledge and a cool head on issues. He cares about Cave Creek and, backed by a strong council, he will do well. Since Usama Abujbarah dropped out only two other candidates, Anna Marsolo and Janelle Smith-Haff remain. Neither had the confidence to go to our forum and answer questions about their candidacy. Bunch is far more acceptable than either Marsolo or Smith-Haff. Anyone who watched Marsolo over the years wonders why she didn’t stay a scrub nurse rather than becoming the town critic when she lived in a county island, not Cave Creek. Unfortunately, she now is a Cave Creek resident. Although she said she did nothing wrong, Marsolo has an obsession about signs, especially in the town core. She had complained to the owners of the Tumbleweed Hotel about a for sale sign they placed in their adjoining building which now houses the rock shop. I guess they told her to mind her own business. Marsolo called former Deputy Town Marshal Bobby Hernandez and complained about the sign. Hernandez told them to remove the sign, which escalated into a verbal confrontation. Hernandez returned to town hall and convinced the Maricopa County Sheriff’s Office he needed help. Deputies went to the Tumbleweed, handcuffed Jeri and Gary Rust, took them to town hall and placed them in a holding cell. Unbelievable overreaction! Fortunately for Cave Creek the Rust’s lawyer and Town Manager Usama Abujbarah worked out an apology and got the town off the hook. Marsolo claimed that since she didn’t sign a complaint she was absolved. Really? Her telephone call was the cause of law enforcement overreaction. Anna recently mailed a two page propaganda sheet to Cave Creek citizens. There are numerous reasons to evaluate her claims and policies as few are good for the town. Before the election we will revisit her worth as a candidate. As far as Smith-Haff goes, she is a single-issue candidate, focused solely on the previously annexed area. We will show where she is wrong on her assertions. Note: I notice that the first election signs are sprouting. It is interesting that the earliest, biggest and most are Wright’s and Reg Monachino’s. Monachino was a slate member, as was Wright, although she came in last in that election. Both are dangerous to the town and we will tell you why. Stay tuned.